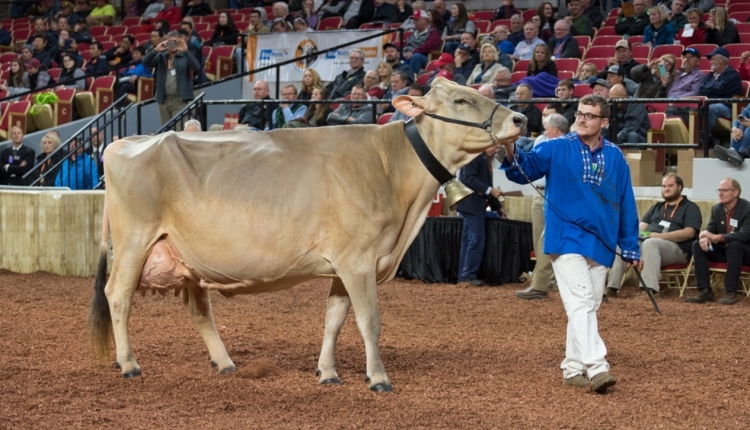 This Brown Swiss champion is no stranger to the colored shavings. Cutting Edge T Delilah was named the Grand Champion of both the International Brown Swiss Open and Junior Shows. It was the third time in four years topping the youth show, and Kyle Barton of Copake, N.Y., has been on the halter since the beginning. Judge Wagner and his Associate Judge, Christopher “Chip” Savage of Union Bridge, Md., evaluated the 335 Brown Swiss entries. Reserve Grand Champion and Reserve Senior Champion honors went to Cutting Edge Stratus Sue, exhibited by Ronald Kelm of Markesan, Wis. She was the first-place aged cow. 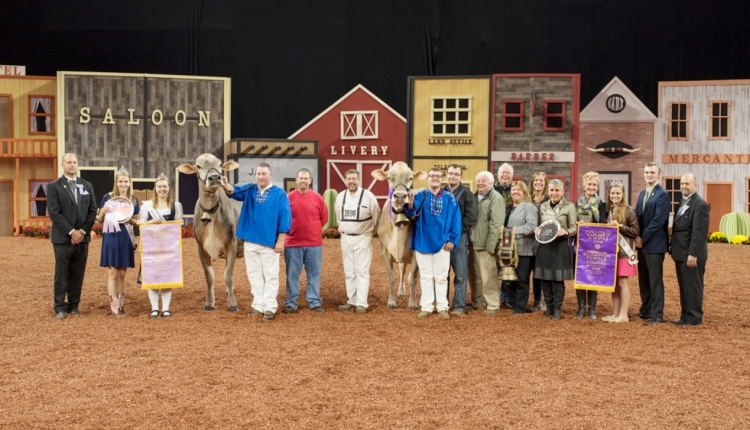 The Intermediate Champion went to Cutting Edge B Kandy, shown by Ken Main, Peter Vail and Allen Brisson from Copake, N.Y. Reserve Intermediate Champion was Iroquois Acres Jong Cali, exhibited by Matthew Pacheco from Kerman, Calif. Junior Champion was awarded to the winning Spring Yearling Heifer, Robland Norwin Mayday, owned by Elijah Landgraf of Jackson, Mo. Reserve Junior Champion was the first-place winter yearling, Wind Mill Carter Snow Angel, exhibited by Ernie Kueffner, Terri Packard, and Mike and Linda Hellenbrand from Boonsboro, Md. The Grand Champion Female of the Junior Show was also your Grand Champion of the Open Show, Cutting Edge T Delilah, exhibited by Kyle Barton of Copake, N.Y. Reserve Grand Champion of the Junior Show respects went to Jenlar Carter Waltz-ETV, shown by Brianna Meyer from Chilton, Wis. Junior Champion of the Junior Show went to Silver Top Allstar Trick, led by Shelby Biasini and owned by Silver Top Swiss of Morrisville, Vt. The Reserve Junior Champion of the Junior Show was Hilltop Acres CT Glaze exhibited by Kaleb, Cole, and Carter Kruse from Dyersville, Iowa. Awarded Premier Breeder and Exhibitor of the Heifer Show and Premier Breeder and Exhibitor of the International Brown Swiss Show was Elite Dairy, Ken Main and Peter Vail of Copake, N.Y. Premier Sire of the Heifer Show was Voelkers TD Carter and Premier Sire honors went to Blessing Tex Braiden ET.